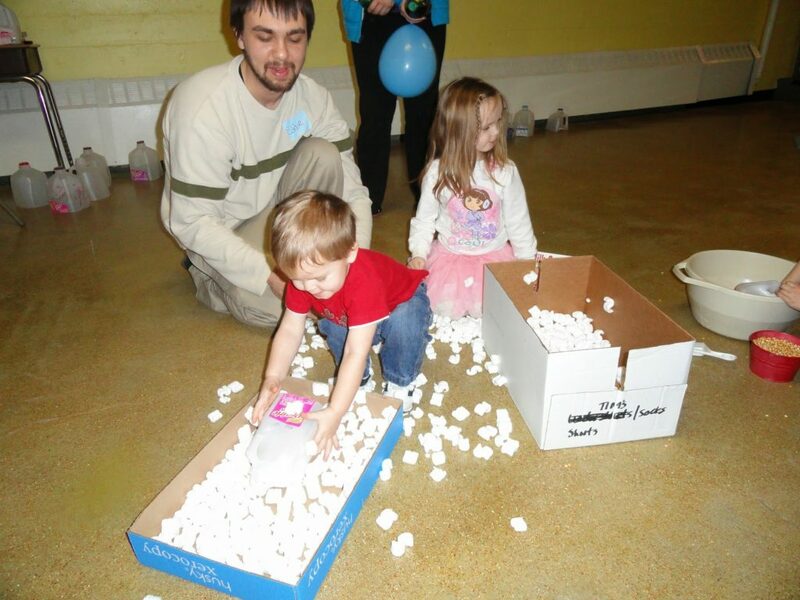 Packing Peanut Play – Indoor Snow? surprises from those who love us! Who knew what was inside today’s box! It was so much fun to see what would be delivered each day. ‘Tis the season for surprises and delights in all shapes and sizes. Hence, the focus of today’s post. 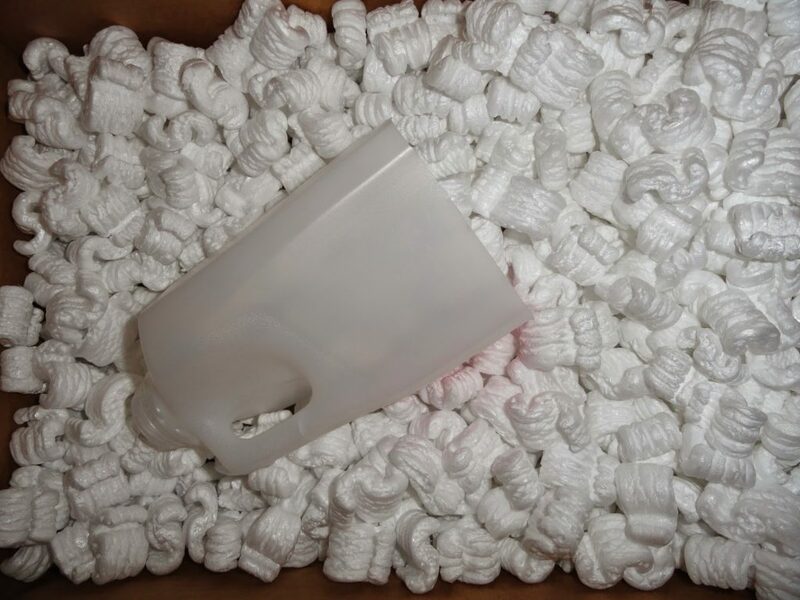 With mail deliveries, come packing peanuts. Many a parent groan over the appearance of these static filled “hopping” Styrofoam creatures. It seems almost impossible to contain them. They hitch-hike and creep to far corners of the room. You find them in the most unlikely places days after you have disposed of the box and packing. How do they do this? But, today we will look at these little squiggly packing peanuts in a new light and explore the many ways they can bring additional joy to the moment. They will be the gift that keeps on giving! Ideas to re-purpose the lives of packing peanuts! 1. Create an indoor snow storm! Yes, I’m for real. Everyone -adults too- take a bag (plastic shopping bags work well) full of peanuts and on the count of three have a “snow storm”! Seriously, this will be fun and your kids will never believe you let them do it! The sane part of this activity for the adults involved is the last part of the game. Set a timer for a few minutes and see who can collect the most “snow” in that amount of time. This is a fun way to clean up after the “snow storm”. Do you have some small plastic children’s snow shovels or sand shovels? Use them to “shovel” snow off of the floor. Tip: save the shipping boxes. They make play even more fun and you have a box to put the “shoveled snow” back into, when play is finished. Don’t rush this activity. Let the kids play as long as they want. Don’t worry… this snow will not melt, stain or destroy. And, it will provide entertainment above and beyond most store-bought toys you could ever give your children. So, sit back, relax, and enjoy your kid’s contentment, excitement and creativity with this activity. 2. 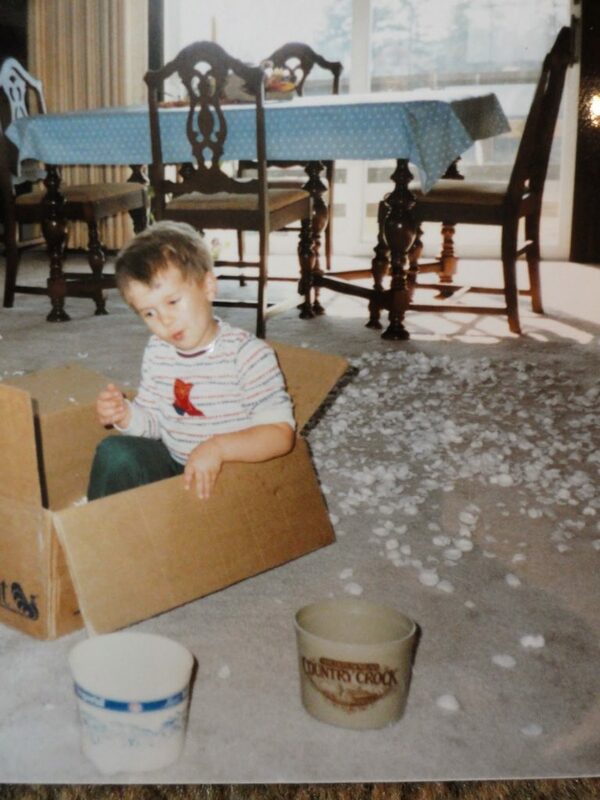 Buried treasure: Fill a cardboard box up with packing peanuts and hide (bury) small toys throughout the box. Then have children search for buried treasure! 3. 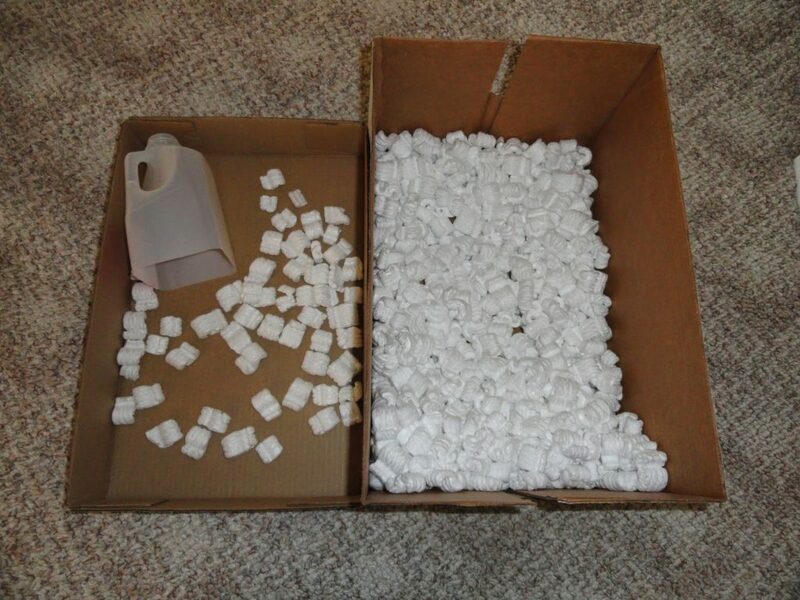 Fill the sink, tub or large box with packing peanuts. Add small toys – cars, trucks, wagons, small,empty (clean) food containers, kitchen items: measuring cups, small plastic cups, empty plastic or cardboard food containers, small sauce pans, etc. Let the play begin! 4. 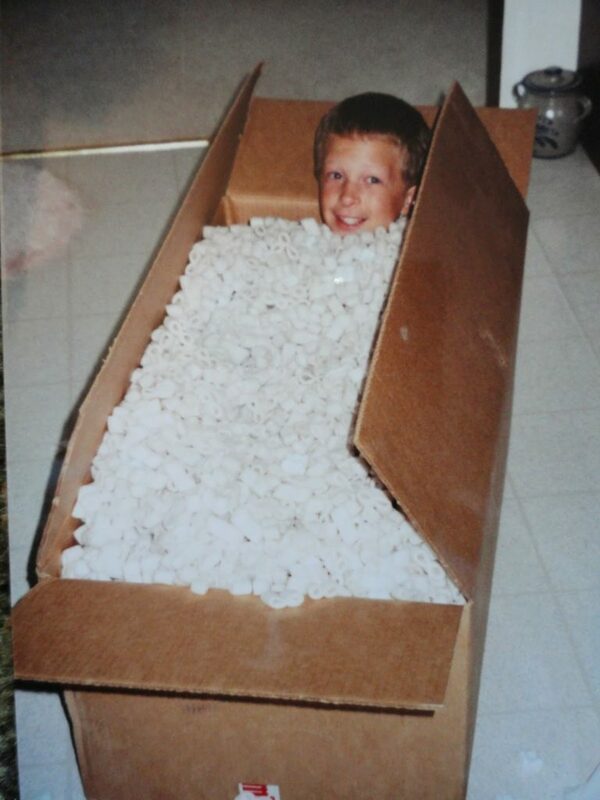 Buried child: Kids love to cover themselves up inside a box with packing peanuts! They also like to curl up in the boxes. You can pretend to “mail” them to grandma! 🙂 Ha! 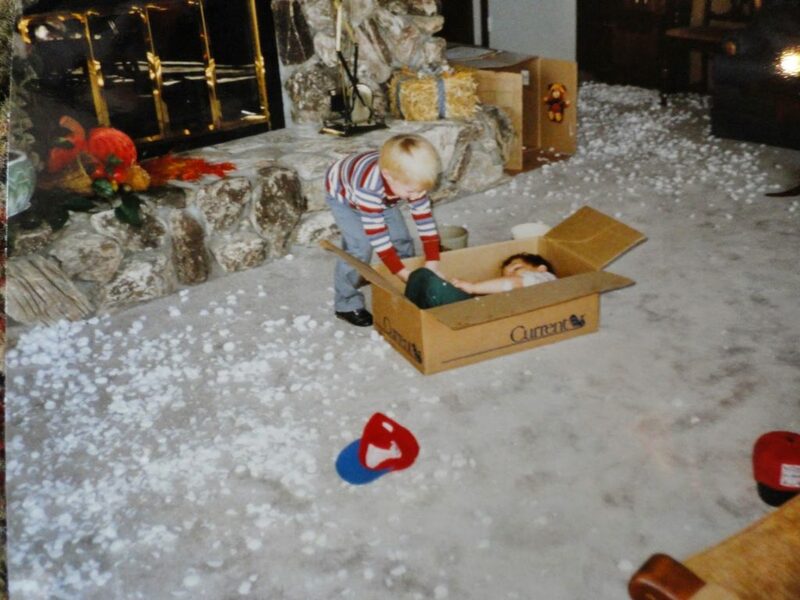 Cardboard boxes become sleds, four wheel drive vehicles, etc. Imagination determines your boundaries. Give this a try and enjoy the giggles and laughs! 5. 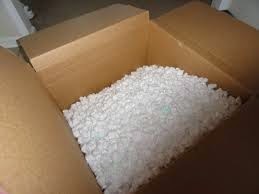 Watch packing peanuts dissolve or float: IF they are the cornstarch packing peanuts, fill the sink or tub with water and add a few peanuts. Watch them dissolve. Count how long it takes to dissolve into nothing. Does it matter what temperature the water is? Does warm or cold water dissolve them faster? Check to see if they are dissoluble and watch them float! Add plastic boats or small plastic containers (clean, empty food containers are a lot of fun! i.e. yogurt, fruit cups, etc.) Styrofoam peanuts make great toys for water play. 6. To make a magnet: With a marker draw eyes, nose and mouth on the end of a peanut. Add chenille wire antennas to one end. Then, add a small magnet on the back. 7. Scoop and Dump: an empty milk carton with the bottom cut out makes a great scoop! As always, make sure activities are age appropriate. If a child still puts everything in their mouth, these are not suitable activities. Always supervise activities with your children and watch for areas of safety concern. Spend time playing with your kids every day, even if it is for just a few minutes. It will be well worth your efforts!